Comprised of Hillary Scott, Charles Kelley, and Dave Haywood, Lady Antebellum took the country world by storm with their debut self-titled album in 2008. Receiving a nomination for Album of the Year at the 2010 Academy of Country Music Awards and going straight to the top of the Billboard Top Country Albums charts, Lady Antebellum were established as a force to be reckoned with on the country-pop scene! Darius Rucker is a musician of many skills, having been in a rock band and released an RnB album before venturing into country with his debut album “Lean To Live”. The single "Don't Think I Don't Think About It”, went straight to number one, followed by two more number one singles “Alright" and "It Won't Be Like This for Long,” setting a trend that was to continue for the rest of Darius Rucker’s career! 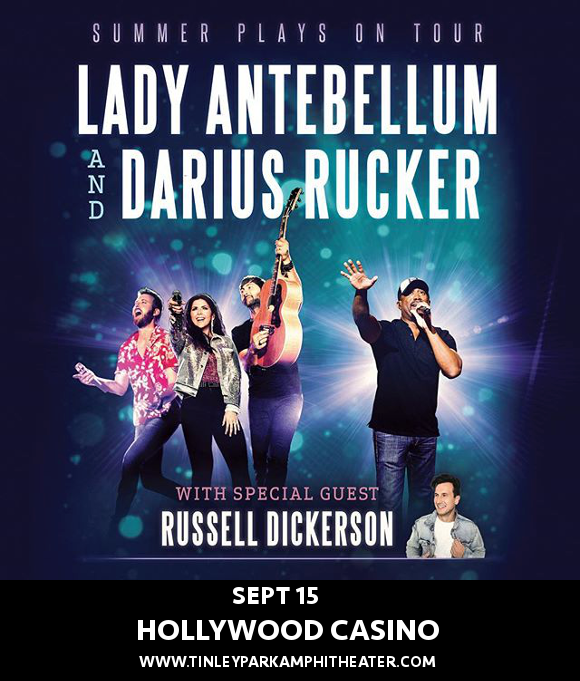 We all loved the collaboration between Lady Antebellum and Darius Rucker in 2013 – we can’t wait to see more of it live onstage!! Get your tickets to the Hollywood Casino show now, before they go! !